The euro weakened slightly against its major peers despite the release of positive Markit PMI data earlier today. The Markit PMI data indicated that there was positive growth in the Eurozone, but this was not enough to stop the European Central Bank to abandon its loose economic policies. Market sentiment towards the euro remained bearish as the currency lost ground briefly against the US dollar, the British pound and the Japanese yen. The composite PMI for January was 54.3 a slight drop from the 54.4 recorded in December, while the market expectation was pegged at 54.6. The manufacturing PMI for January was at 55.1, which is a 69-month high, and higher than the 54.9 recorded in December. Despite the positive data released recently from the Eurozone indicating that most economies are reporting positive economic growth, Mario Draghi, the ECB President, is still keen on maintaining quantitative easing measures. The dovish outlook he outlined last week also served to make investors cautious towards the euro. The negative market sentiment towards the euro is likely to last, especially with the upcoming elections in France, Germany, the Netherlands, and probably, Italy. Many investors view these elections as quite destabilizing and as such they have a negative sentiment towards the euro. The EUR/USD was trading at 1.0752 as at 17:16 GMT having tested a low of 1.0727 after the PMI data was released. 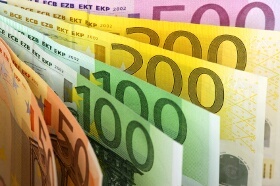 The EUR/GBP was trading at 0.8580 having opened the day trading at 0.8595.